Let the good times roll and have a Mardi Gras Party! Celebrate Mardi Gras with traditional New Orleans fare like King Cake, French Market Beignets, Po'Boys, Muffulettas and Hurricane Punch. 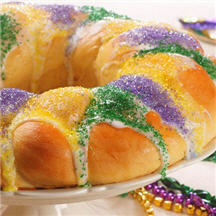 King Cake is the traditional Mardi Gras dessert. The three colors that decorate the cake are symbolic to the festival: purple for justice, green for faith and gold for power. 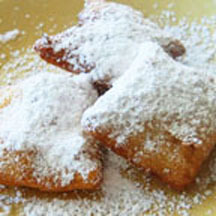 Sip café au lait while enjoying a warm beignet, a traditional New Orleans deep-fried yeast pastry served with a generous dusting of powdered sugar. 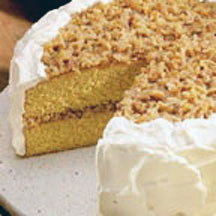 Let the good times roll with this scrumptious butterscotch chip and coconut-filled cake with Seafoam Cream Frosting.